The First Manhattanhenge of 2018 Is Coming Up. Here’s Everything You Need to Know. In New York City, concrete usually blocks out the sun. 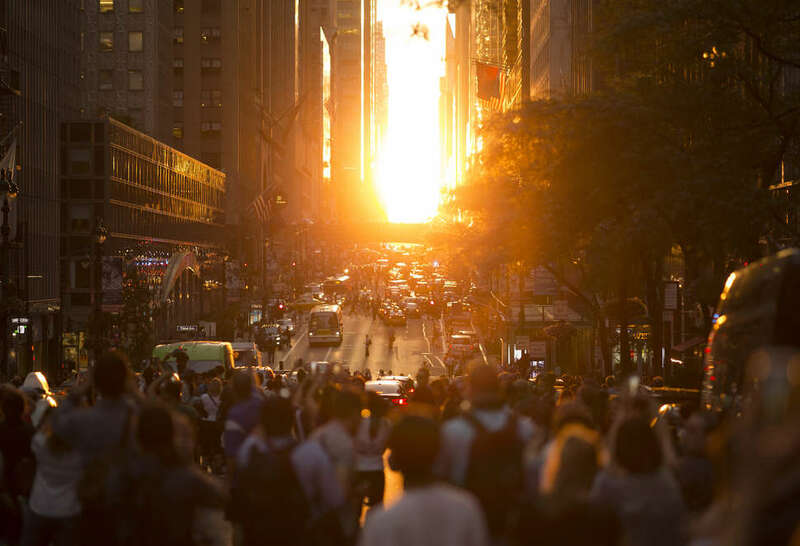 New Yorkers are used to seemingly permanent shade on many city streets, but twice a year, we’re gifted with a brief but beautiful reprieve when Manhattanhenge occurs. Manhattanhenge strikes when the sunset perfectly aligns with Manhattan's east-west grid, flooding crosstown streets with cascades of sunshine. It's a portmanteau that draws its name from Stonehenge, the eerie, prehistoric monument in Wiltshire, England that researchers believe was built to align with summer and winter solstices. While Stonehenge is a magnet for weirdos in robes paying homage to ancient spirits, Manhattanhenge largely provides an excuse to stand in the middle of a busy street and snap Instagrams. Tourists love it, but that doesn't mean it isn't worth your time. There are plenty of great vantage points across the city, some of which have bars, and others that are totally free. Manhattanhenge is inescapable, so you're going to have to brave the crowds as the sun descends on the city and pisses off every cab diver in Manhattan. Here's our comprehensive guide to Manhattanhenge, including how best to see it and what you can expect. Barring no gloomy skies, you'll be able to see Manhattanhenge -- both the full sun and the half sun -- in late May and mid-July. The difference between full sun and half sun is simple: During the half sun, only the top half of the orb can be seen setting on the grid. During the full sun, you can see the full circle setting on the grid. Nature must love America, because the dates also happen to (loosely) coincide with Memorial Day and Major League Baseball's All-Star Weekend. 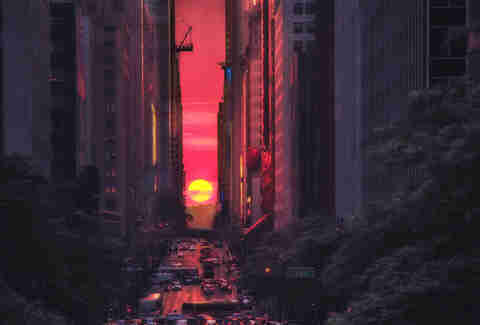 Aside from an opportunity to howl at the sun, Manhattanhenge is the sun's perfect alignment with Manhattan island's grid. When it occurs, the urban matrix lights up as the sun cuts through the city's east-west streets. Jackie Faherty, senior scientist at the American Museum of Natural History, explained why this phenomenon happens in Manhattan. Namely, we should be thanking the geological formation of the island from thousands of years ago, not to mention the Commissioners Plan of 1811, which prized symmetrical 90 degree streets. "The shape of the island was set by nature," she said. "Specifically by glaciers and erosion long before humans ever took notice of where the sun was setting. The luck is that the long part of the island of Manhattan goes roughly north-south (but not exactly north-south). And the cross streets run east-west. It’s orientation shifts such that the days of alignment with the setting sun are on either side of the summer solstice, when the days are long and the evenings are enjoyable for standing outside and watching the horizon." Celebrity scientist Neil deGrasse Tyson, who coined the term "Manhattanhege," recommends watching it from Manhattan's biggest east-west streets; specifically, on 14th, 23rd, 34th, 42nd, and 57th streets, facing west toward the Hudson River. The further east your vantage point, the better, according to Tyson. Some the city's more iconic edifices, like the Empire State and Chrysler buildings, take on mesmerizing sheens when blanketed with all that light, he said. Still, if you're not trying to wade through all the selfie sticks and fanny packs in the middle of the street, there's the High Line and many of the aforementioned rooftop bars. Also, street-facing fire escapes may serve good perches. If you're in Manhattan, it's crucial that you're within the grid system. You can't see Manhattanhenge in say, the Lower East Side, which is its own maze of tight-knit blocks. 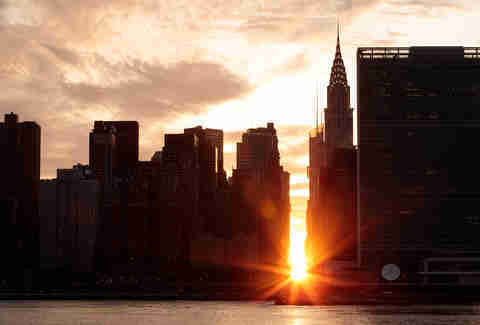 However, you can see Manhattanhenge from parts of Brooklyn and Queens (GASP!) along the East River, but you're going to need an eagle's eye view west to New Jersey. As Faherty explains, "As long as you can see all the way across Manhattan to New Jersey, you will catch the event." 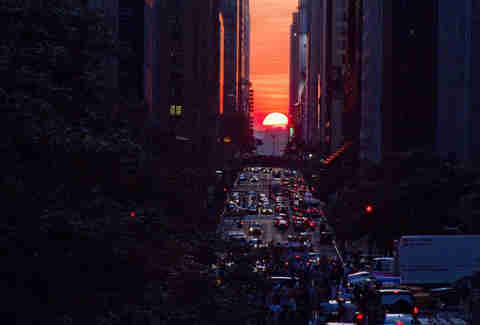 No matter where you decide to watch Manhattanhenge, you'd better get there ahead of time to claim a good spot. Some Manhattanhenge super-fans show up to their favorite spots in the morning and camp out all day. Clouds regularly spoil the whole occasion, so check the forecast or just take a good look at the horizon to the west before you head out. As Faherty notes, "Any grid facing East West has the potential of creating a bullseye for the sun to land upon." Manhattan, a sprawling network of intersecting streets and general chaos, is specially primed for this phenomenon. "The Astronomy 101 reason for why it happens is that the Earth is titled by 23.5 degrees to the plane of the sun," she said. "Manhattan has the lucky coincidence of having an alignment that falls on either side of the summer solstice when the weather is ideal for watching sunsets." All said, Manhattanhenge is a distinctly New York thing that manages to bring large crowds together for exactly zero dollars. You won't want to miss it. Sam Blum has lived in New York for five years and has never seen Manhattanhenge. Follow him on Twitter @Blumnessmonster.